This wildlife tour covers two spectacular parks of central India Kanha & Pench, both unique & diverse. Pench is primarily a Teak forest also popular for Tiger & Wild Dogs. Pench is the forest which inspired Rudyard Kiplings – The Jungle Book. 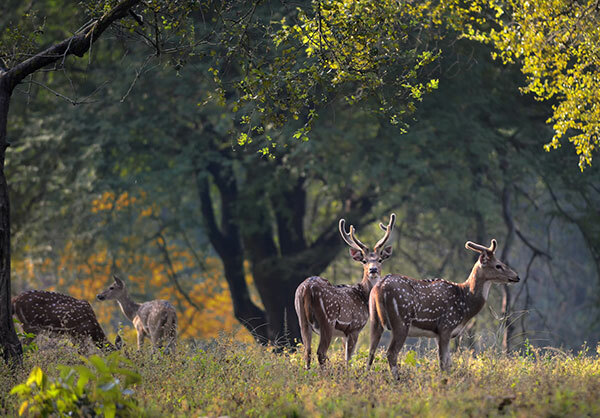 Kanha is famous for its lush green grasslands and towering Sal forest. Kanha is popular for Tigers, bird watching & is the last home of the only surviving population of Hard Ground Barasingha (Swamp Deer). Day 01: Kanha National Park Reach Kanha Earth Lodge by lunch, evening at leisure followed by dinner. Day 02: Kanha National Park Morning and evening jeep safaris in the Kanha Tiger Reserve. Day 03: Kanha National Park Morning and evening jeep safaris in Kanha Tiger Reserve. Day 04: Kanha – Pench National Park Post Breakfast transfer to Pench National Park (3 hours), lunch on arrival at Pench Tree Lodge. Evening spend time at the in house organic vegetable & herb garden. Day 07: Pench National Park Post breakfast transfer for further connections. Tour cost: USD 1365 per person on twin sharing. Four shared jeep safari in Kanha with entry fees, jeep charges and guide charges included. Road transfers by air conditioned Toyota Innova or similar between Kanha and Pench. Kanha also popular for Tiger & the last stronghold of Hard Ground Barasingha (Swamp Deer). Known for its towering Sal forest & teeming grasslands. Pench jungles provided the inspiration to Rudyard Kiplings The Jungle Book. Also popular for Tigers & Wild Dogs.